This section will explore the main reasons people start a co-operative, some of the key advantages and disadvantages of the business model, as well as how to start and incorporate a co-operative. Employees wish to buy out their employer and take over the business - otherwise referred to as business succession. NOTE: Groups incorporating a co-operative business can now do so through ServiceOntario and the Ministry of Government and Consumer Services (note: it used to be through the Financial Services Commission of Ontario FSCO, which was more time consuming). Information and forms are available online, but the automated registration system is still under construction. A co-operative is a distinct form of enterprise that is both a business and an association of people. The success of a new co-operative depends on how well these facets of the enterprise are established at the onset. A co-operative can be more challenging to set up than other types of enterprises, but once established, they tend to thrive in the marketplace and are more stable than other business models. Speaking to a Co-op Developer is a great start, as legal or financial advisors may not be familiar with all of the options available to you when organizing as a co-operative business. Apart from OCA, Co-opZone is a great resource that can link you to a Co-op Developer, as well as provide other useful tools and information on developing a co-operative. Learn more about Working with Consultants. To get started, check out the 10 Steps to Starting a Co-operative. You can also download the Starting A Co-op Guide - a general overview of the co-operative development process that can help you explore the steps required to plan, develop, incorporate and launch your co-operative. Incorporation grants your organization legal rights and recognition under the law. This legal status allows a co-operative to purchase assets and take on debt, and generally makes it easier to raise capital. It also limits the liability of individual co-op members in the event of legal or financial difficulty. While a group can operate as a co-operative on an informal basis, it cannot use the word ‘co-op' or ‘co-operative' in its name, or be recognized under the law, unless it is formally incorporated. A co-operative is incorporated either provincially or federally, and in turn is governed by either a provincial/territorial Co-operatives Act, or the Canada Co-operatives Act. The difference relates mainly to where the co-operative will operate: a federally incorporated co-op will carry out operations in at least two provinces/territories, and have fixed offices in more than one province or territory. Read Choosing Federal or Provincial Incorporation to learn which one is right for your co-operative business. Ontario co-operatives are regulated by the "Ontario Co-operative Corporations Act," with the exception of credit unions and caisses populaires, which are regulated under the Credit Unions and Caisses Populaires Act. Service Ontario, under the Ministry of Government and Consumer Services, now administers the Act and registers organizations conducting business as a co-operative under the Act. Many co-operatives are regulated under additional pieces of legislation. For example, Daycare co-operatives are also regulated under the Day Nurseries Act. 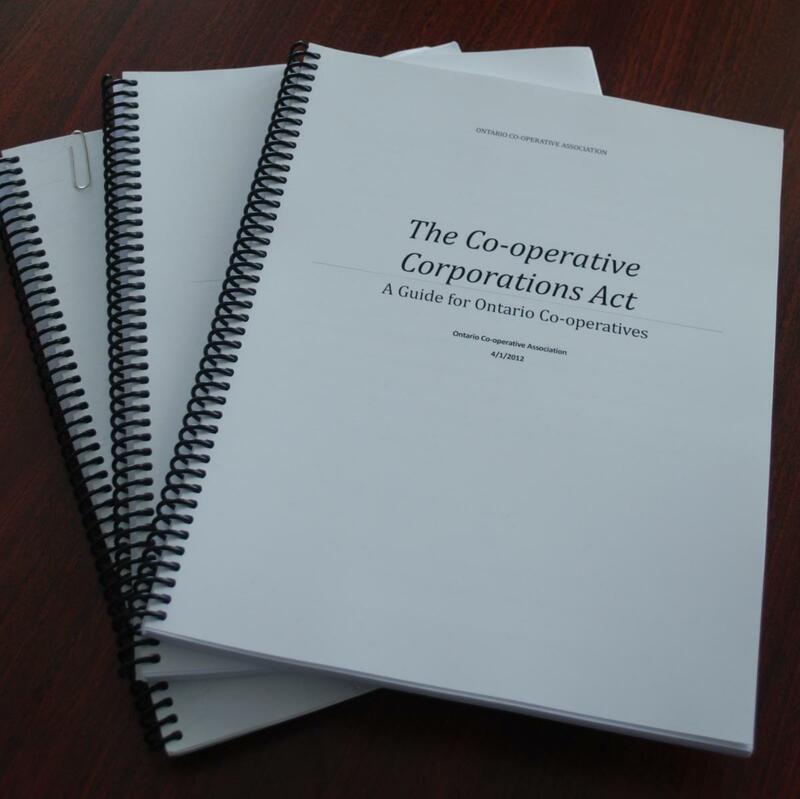 OCA created the "Guide to the Ontario Co-operative Corporations Act" in 2008 - a comprehensive tool that explains the details of the Act, includes advice about the procedures and protocols that define the operations of co-operatives, along with comments on how certain provisions may be used. It is available in a searchable e-version (PDF format) in English only. Every co-operative in Ontario should own at least one copy as a reference guide! View our FactSheet on the Guide to the Ontario Co-operative Corporations Act, or click on the photo to get your own copy today!